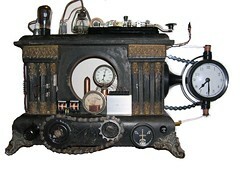 I built this steampunk clock after seeing other steampunk items on BoingBoing and just got inspired to make my own. This one is built on an empty vintage clock case from around 1910, and the parts came from local radio repair shops, a bicycle repair shop, Home Depot, and various car wreck sites that I pass on my daily walk. There's also a part (see if you can spot it) from an old Model T car, AND a working telegraph key. Besides the funky steampunk look, the best thing about this is that it tells the actual time, a good thing, since I'm an obsessive punctuality freak.